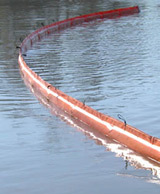 InShore Boom is an economical fence-type boom deployed as prevention boom in high spill risk operations (e.g. ship refuelling, bunker operations) and as a response boom in sheltered waters. Lightweight with a flat cross-section, the design allows for compact storage on Boom Storage Reels or in deployment containers. InShore Boom is easy to deploy, handle and recover. InShore Boom is manufactured using RF welding technology. Available in 50 and 100 foot linkable sections. Please contact us for further information and pricing on Containment Boom for your application.